Dr. Thomas W. Hilgers, director of the The Pope Paul VI Institute, has had a great deal of interest in Mexico since the 1980s, and he was responsible for leading the first translation team to work on translating the Creighton Model materials into Spanish. However, it has been within the last five years that our work has gained momentum, with the establishment of FertilityCare Centers in Mexico, as well as physicians who provide NaProTechnology services. The Institute has developed a five-year plan to establish the infrastructure for this work in Mexico, and this includes our formal affiliation with the Universidad Panamericana School of Medicine. In 2017, we started our third Education Program in Mexico, training 27 new students at the Casa Lago conference center in Mexico City. One of the newest recruits to the cause of NaProTechnology is Alejandra Martinez Goldaracena, an OB-GYN in Mexico City. She had never heard of the Creighton Model until Nov. 2016, when she was introduced to the work of the Pope Paul VI Institute by Dr. Gregorio Obrador, Dean of the Medical School at the Universidad Panamericana in Mexico City. Dr. Obrador has been working with the Pope Paul VI Institute to bring NaProTechnology into Latin America. Now, Alejandra has had a crash course in the Institute’s work. Dr. Victor Topete, an OB-GYN medical consultant in Puebla, Mexico, invited Alejandra to participate in EPI in Mexico City in March. Alejandra went on immediately to complete EPII in Omaha in April. Alejandra (right) listens to a lecture by Dr. Hilgers on Advanced Case Management during Education Phase II in Omaha in April, 2017. Part of Alejandra’s “crash course” with the Institute was not just learning about the Creighton Model and NaProTechnology, but also learning English, which she was not fluent in at all when she started just a few months ago. 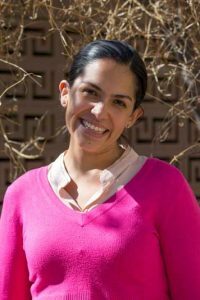 Alejandra has discovered since then, however, that the Creighton Model itself is a language all its own, which transcends either English or Spanish. As of today, teaching materials for the Pope Paul VI Institute have been translated into 15 different languages, including Spanish. With more Education Programs scheduled in Mexico City through 2018, hope and healing will continue to flourish in Central America and around the world.